Olivia Garden is a company which is founded in the year 1967, in Belgium by Jean and Micheline Rennette. Olivia Garden has a long history of creating and promoting high quality and innovative products in order to fulfill not only hairdressers professional needs, but also customers needs and wants. Nowadays Olivia Garden is one of leaders in the salon industry, manufacturing and distributing its production in over 70 countries all over the world. Olivia Garden manufactures products such as apparel, combs, brushes, curlers, brush merchandisers, shears, as well as tools such as brush and comb cleaners, clips, collars, organizers, oil brushes and edge razors. These Olivia Garden hair cutting and thinning shears from Silk Cut collection SK-C02 are made of reinforced steel alloy which ensures extra strength and ultra sharp cutting edges. Hair cutting shears has convex hollow ground blades, but hair thinning scissors have two kinds of blades – one of them has convex edge, but other has 34 micro-teeth. 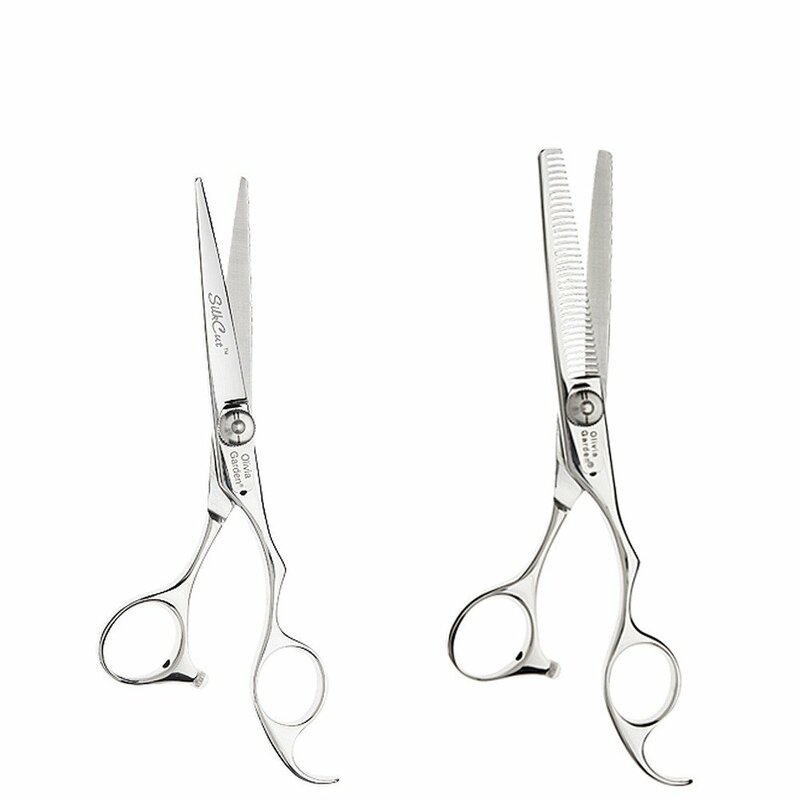 Both scissors have hand honed blades which are razor-sharp and provide smooth and accurate cut. Shears for hair cutting are 5.75 inches long, but scissors for hair thinning are 6.0 inches long. Both of these Olivia Garden shears have adjustable leaf spring tension, therefore, every hairdresser can set desired tension. What is important, this tension screw has dial markings which ensure extra precision. They also have finger rest for superior comfort and ergonomics, but unfortunately it cannot be removed. This Olivia Garden set includes removable rubber finger inserts for finger rings to improve fit and thus comfort – two of them are white, but two of them are black, so you can combine them as you wish. Both of these Olivia Garden hair scissors have asymmetric or, in other words, offset handle with thumb curvature, providing unbelievable comfort all day long. Another feature of these shears is cushioned silencer which provides not only silent, but also balanced and controlled cutting. This Olivia Garden Silk Cut collection SK-C02 set includes one piece of hair cutting shears, one piece of hair thinning scissors, shear care mini-drop oil brush, as well as zippered designer storage case for safe and comfortable movement. It is important, that this Olivia Garden product has lifetime warranty against manufacturing defects. As both of these Olivia Garden hair shears are made of steel, they are silver color with slight sheen. Both of them have asymmetric or offset handle with curved shin or thumb curvature which not only rests a thumb, but also adds them elegance and style. Storage case is made of plaid fabric in brown shades. As one might guess, cutting shears are intended for hair cutting, but thinning scissors are intended for hair thinning. As this Olivia Garden set from Silk Cut collection has all of necessary tools and qualities, it is suitable for professional usage, namely, they are suitable for professional barbers, so they can be used in barber shops. These Olivia Garden Hair Cutting Shears from Silk Cut Collection SK-C02 are made of reinforced steel alloy. Hair cutting shears have hand honed convex hollow ground blades, but hair thinning scissors have hand honed convex edge and 34 micro-teeth blades. Cutting shears are 5.75 inches long, but thinning shears are 6.0 inches long. As they are made of steel, they are silver color with slight sheen. They have asymmetric or offset handle with thumb curvature, adjustable leaf spring tension, non removable finger rest, removable rubber finger inserts, as well as cushioned silencer. This Olivia Garden set includes cutting shears, thinning scissors, shear care micro-drop oil brush, as well as designer storage case. This set is suitable for professional hairdressers and hair salons. It should be mentioned, that this Olivia Garden product has lifetime warranty against manufacturer’s defects.